There are a few ways to use voice over IP (VOIP) on your smartphone in order to make or receive phone calls, Skype being the most popular service. Vonage, a VOIP pioneer, is now also available on mobile devices, and they have a pretty good offering. Similar to Skype and Viber, Vonage lets you make free high-definition calls and send free texts to other Vonage Mobile app users anywhere in the world. The app works over both Wifi and your cellular dataplan. So up till now, cool but not much new, right? In order to be able to compete with these other telephone applications, Vonage Mobile is giving all users of this mobile app free calls to ANY phone in the United States, Canada or Puerto Rico from anywhere in the world. So you can install this app and use it to make free outbound calls to any US number, not just to other users on the Vonage network. Not bad for a free app. According to Vonage's CEO they are currently developing a feature that will let people also receive calls on their main number while traveling internationally, which would be a great way to save on those damn roaming charges. Making calls with the app is very similar to making regular calls using your phone, the only difference is that you launch the Vonage app instead of the standard dialer. 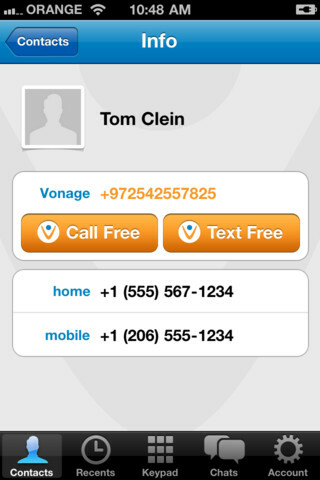 Vonage Mobile is available for both iPhone and Android.